We proudly introduce ourselves as Medico Remedies Ltd, a leading manufacturer and exporter of pharmaceutical formulations including tablets, capsules and suspensions. 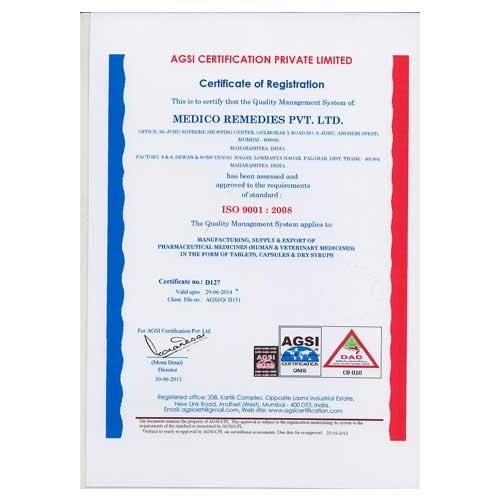 We have a WHO-GMP approved, ISO 9001-2008 certified state of the art manufacturing plant located at Palghar, India. We have an annual turnover of approx US $ 5 million. The Director of the Company, Mr. Haresh Mehta is a pharmacy graduate (B.Pharm) having more than 25 years of experience in this field. We are supported by a very well qualified and competent technical staff specializing in R & D and in new product development. We have a wide portfolio of products exporting to more than 30 countries of the world viz Myanmar, Vietnam, Dominican Republic, Sri Lanka, Philippines, Australia, Turkmenistan, Guyana, Ghana, Congo, Iraq, Honduras, Cuba, HongKong, Nigeria, Senegal, Panama, Mozambique, etc. We have a strong presence in various therapeutic categories like antidiabetics, antihypertensives, antiretroviral, anticoagulants, antimalarials, antihistaminics, multivitamins, anti-inflammatory etc. MEDICO's quality focus encompasses all areas of operation – starting from procurement of the best raw materials to optimum manufacturing technology to precise delivery of the customer's requirements - thereby ensuring a rapid penetration of both domestic and global markets. We at MEDICO welcome importers, distributors and agents who will help to introduce our products in their national markets. GMP certified quality assurance procedures guarantee a peak performance of all products. We provide attractive dossier licensing opportunities also. We assure prompt and reliable delivery of our services to all our clients. We welcome any enquiry from your company and hope for fruitful business in the future. Medico Remedies, a complete life care concern, offers best quality pharmaceutical formulations, manufactured in compliance with the WHO GMP/CGMP/ISO specifications and FDA India guidelines. To optimize our business efficiency and to offer impeccable range of pharmaceutical formulations, therapeutic and other formulations, ointments, injectable, branded and generic drugs; a stringent quality assurance program is implemented in our unit. Each product and formulation is thoroughly tested during different production stages like -procurement, production, packing and distribution. In our in-house quality control department, well equipped with the modern testing facilities, best and hygienic packaging of our products is ensured. Our dedicated and professional team develop all the products in conformation with the international specifications and requirements of W.H.O.-G.M.P, C.G.M.P. Apart from this, our plant and systems are inspected by various international inspectors from several parts of the world.